Americans of the Revolutionary Era regarded the "West" as those lands between the Appalachian Mountains and the Mississippi River. The area beyond the Mississippi was then largely unexplored and in the possession of foreign powers. The West had been the object of much recent contention; Britain and France bitterly struggled for control of the area during the French and Indian War (1754-1763). In the aftermath of that conflict, Britain attempted to halt the westward movement of American settlers in the Proclamation of 1763, one of a series of events that led to the estrangement of mother country and colonies. By the 1780s, seven of the 13 original states had enunciated claims to areas in the West. These so-called "landed" states had a great potential advantage over the six "landless" states. It was assumed that the future sale of western lands would enrich the landed states and possibly allow them to operate without any form of taxation. The landless states feared that they would lose residents and dwindle into insignificance. The claims to the western lands were usually rooted in the vague wording of old colonial charters. The picture was further complicated by the fact that the claims often overlapped one another, which pitted one state's interests against another. As the War of Independence approached its conclusion, the Articles of Confederation government struggled with this problem. Time was of the essence, since thousands of settlers were crossing the mountains into the new areas. The Congress  in one of its few triumphs of this era  worked diligently to induce the states to surrender control of their claims to the central government. The process required nearly 20 years and was completed by the successor government under the new U.S. Constitution. Virginia. Being the possessor of the oldest colonial charter, Virginians felt confident that they had the best claim to lands in the west. The commonwealth asserted its right to a huge tract that fanned out to the west and north, which encompassed the expanses of the Old Northwest (the Ohio country). However, despite the size and seeming solidity of its claim, Virginia was among the leaders of the movement to surrender the areas to the central government. Business leaders preferred to have a viable confederation of states than claims to western lands. Virginia surrendered its claim to the Northwest in 1784, but held on to the rich lands directly across the mountains until the new federal government was in place. That latter area, Kentucky, became a state in 1792, the same year that Virginia formally vacated its claim. Connecticut. Connecticut put forth a claim to a swath of land from its western boundary to the Mississippi River. A claim to a portion of Pennsylvania (not shown on the map) was asserted only half-heartedly because of the strength of a more recent charter held by that state. Connecticut and New York jointly claimed lands in the Old Northwest, but New York surrendered its rights in 1785 and Connecticut followed the next year. However, Connecticut's claim to an area known as the Western Reserve was maintained until 1795, when it was purchased by the Connecticut Land Company. Massachusetts. A claim to a portion of present-day Michigan and Wisconsin was surrendered by Massachusetts in 1785 and a much weaker claim to an area in western New York (not shown on map) was given up in 1786. East of the Appalachians, Massachusetts vied with New Hampshire and New York to claim Vermont, which achieved statehood in 1791. New York. In 1782, New York ceded its wispy claim to a large tract (not shown on map) that included much of present-day Ohio, Indiana, Illinois, Michigan, Kentucky and portions of central Tennessee and western Virginia. North Carolina. 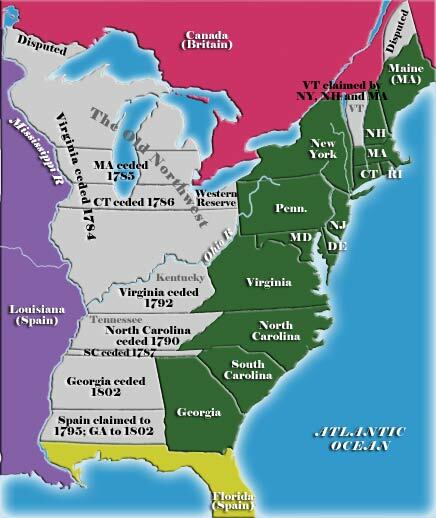 North Carolina attempted to surrender its western claims in 1784. Settlers in what would later become Tennessee, particularly along the Watauga River, paid few taxes, but demanded assistance with fending off Indian attacks. It was not until 1790 that the central government accepted North Carolina's cession. South Carolina. In 1787, South Carolina gave up its claim to a narrow strip of land running from its western boundary to the Mississippi River. A portion of this claim was added to northern Georgia and the remainder was ceded to the central government. Georgia. Georgia, possessor of the weakest claim to western lands, held out the longest. The area that later became Alabama and Mississippi were given up in 1802, which completed the process of surrender. The ceding of western lands by the states was accompanied by a series of laws passed by the Articles Congress to organize the areas and prepare them for statehood. These measures included the Ordinance of 1784, the Ordinance of 1785, and the Great Northwest Ordinance in 1787. Louisiana, a name applied generally to the lands west of the Mississippi River, had passed from Britain to Spain following the Seven Years' War (1763), but reverted to Spain after American independence (1783). During the Napoleonic Wars, Louisiana would pass to France (1800), and shortly thereafter be sold to the United States in the Louisiana Purchase (1803). Florida also passed from one European power to another. France gave up its claim to Florida to Britain in 1763 following the Seven Years' War, but Spain ended up with the territory as a consolation prize (having failed to secure Gibraltar) at the end of the American War of Independence in 1783. Spain surrendered its claims to present-day Alabama and Mississippi in Pinckney's Treaty (1795). The United States purchased Florida under the terms of the Adams-Onís Treaty in 1819. The Canadian border question was not satisfactorily addressed in the Treaty of Paris at the conclusion of the War for Independence. Two particular border issues remained, Maine-New Brunswick and the area immediately west of Lake Superior, and were not settled until the Webster-Ashburton Treaty in 1842.